Newburgh-on-Ythan Golf Club, Scotland, April, 2012. Last week, I played a round at Newburgh-on-Ythan Golf Club, in northeastern Scotland. The twelfth hole is called Home—an odd name for a hole far from the clubhouse. The explanation is that the course, which was first laid out in 1888 and originally had just nine holes, used to end there, across the Ythan estuary from the Udny Arms Hotel. The original clubhouse, which is cottage-size, still exists and stands nearby, although it hasn’t been used in many years. The current tenth hole, which was once the seventh, is a short par 4, just 339 yards. It was the same length in 1888, when it was called Long. (In those days, it was the only hole over 300 yards, and one of just two over 250.) The fifteenth, near the old third, is called Boat House, because the old hole’s green was next to the hotel’s boat house. And the thirteenth, Majuba, was named after a battle in the Boer War, which was a topic of discussion during the club’s early years. 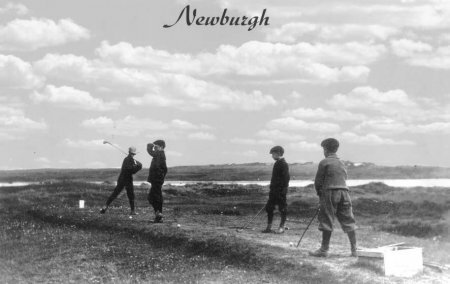 Newburgh-on-Ythan Golf Club, Scotland, early 1900s. One of my favorite courses anywhere is the Island, in Donabete, Ireland, a few miles north of Dublin. Its fourteenth hole—which may be the world’s most intimidating short par 4—is called Old Clubhouse, because the old clubhouse used to stand where the tee box does today. In fact, the teeing ground is framed by the old foundation. And the club is called the Island because that’s what it looked like to the original members, who got to it by rowing across the estuary of the River Broadmeadow from Malahide, where golf-playing on Sundays was forbidden. This entry was posted in Back-Roads Scotland, Golf Courses, Ireland, Scotland and tagged Donabete, Dublin, Malahide, Newburgh, Newburgh-on-Ythan, The Island by David Owen. Bookmark the permalink.